Written by Mark Forrester on August 31, 2011 Product news. Swatch is a FREE, yes you read that correctly, business theme with a portfolio module that allows its usage to be completely diverse. This is a big move for us to release a fully-fledged Business theme for free, considering that we’ve generally preferred to tone down the functionality for our other free themes. The pixel perfect Swatch homepage. Swatch was designed and submitted to us in March by the talented UK web designerÂ Oliver Long,Â with WooThemes having every intention to release this theme as aÂ commercialÂ product. It’s packed full of the usual features you’ve come to expect from our commercial themes, and built on the WooFramework that powers all our themes. Swatch comes with custom post types for the featured homepage slider and mini-features to highlightÂ noteworthyÂ features about your business, service or website, as well as a custom post type reserved for the portfolio. The homepage boasts up to 7 widgetized regions where you can place a heap of widgets, including 8 custom woo widgets, or just set up your theme options correctly and the homepage will use the modules presented on our demo. 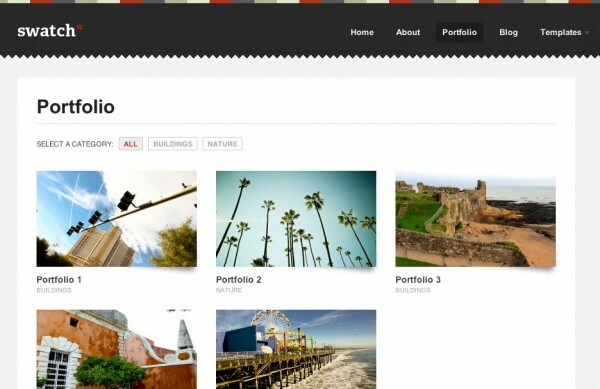 A portfolio module in a free theme. It can't be? We encourage you to browse the demo to discover all the free goodness available to you, as well as our theme listing page. Thank you, thank you, thank you to our wonderful community of supportive WooTheme users. We hope this theme results in growing our community even further. We have LOADS in store over the next month so appreciate our existing club member’s patience in releasing our next impressive commercial theme. In addition to celebrating our 100th theme release in some free style, we’re also extending the awesomeness beyond Swatch… For the next 48 hours, you can purchase 10 Developer Package Themes for only $100. Select the Developer Package for any theme you’d like to purchase and go to the checkout page. Complete the form and use the coupon code “100themes”. Once you’ve validated that coupon, you’ll see the price decrease from $150 to $100. Congratulations for the milestone. You’ve surprised us. Congrats on the milestone and best of luck for the future. Congrats, guys. The theme looks great in the real, despite my previous comment about it looking ‘run-of-the-mill’. Great offer too. Congrats on your 100th! Great looking FREE theme. Congrats Woo dudes, hats off to all of you! It’s a fab theme, in fact I’m off to download it now for one of my sites. Thanks. Im always impressed with the features and customizations of your themes and Swatch is no exception. Congratulations on you 100th theme! 1. Congrats on the 100th theme. Love you guys’ work. 2. Think you’ll ever do tumblr themes again? 3. Does Woo commerce mean I’ll finally get a Woo Ninja doll for my desk????? Again congrats on the milestone…you deserve to celebrate. I will call immediatly the mayor of Paris for a huge firework at the Eiffel Tower celebrating WooThemes. Congratulations for your incredible work and support. Great news and I like the $100 for 10 themes thing too. I’m not over the moon with the new 100th theme but it’s free so hey ho! I’m a Canvas fanboy. Keep up the great work folks. if I use the 100Themes coupom, Do I need to use all credits now, or I can use them later? Very nice, ’cause it’s hard choosing 10 once. Are there some kind of expire date? In my opinion, the most important thing is having access to docs and forum. Once I buy the theme I will have access to all docs and forum support? Awesome way to celebrate 100th release! Interesting offer there, 10 Themes for $100. the coupon is not working. I tried. It not working. I assume the 10 for $100 offer does not include the Listings theme? Or is that also part of the 100? Unfortunately not, the Enterprise themes are not included in the Developer packages. Congrats! Trying to purchase with the code, but getting transaction error. Have to go to airport for overseas trip and won’t be online for a couple of days. Hoping you’ll help me get the 10 themes when I return. Congratulations on your achievement and thanks for sharing with us! Seriously, $100 for 10 of your themes is an amazing deal given the high-quality code and ease of use. 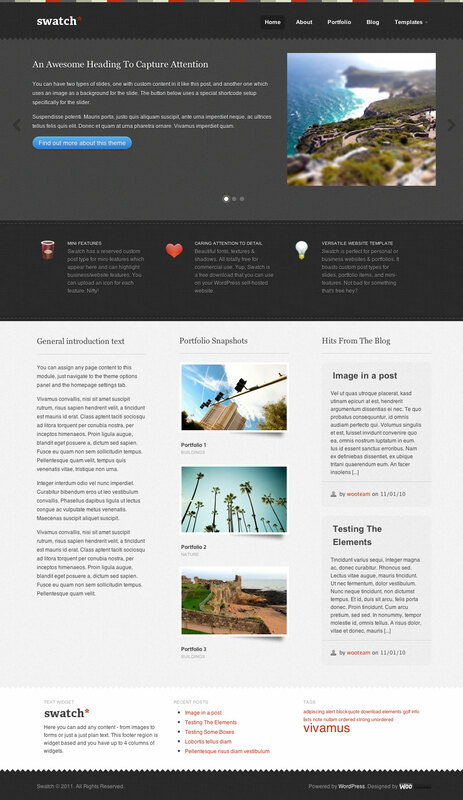 Woo Themes is always my first go-to when looking for a pre-made wordpress theme. Here’s to continued success! This is an incredible free theme. It is perfect for my next project. WooThemes is great. Quality themes, great support and a stellar admin panel. Your framework is easy to customize and I’m sure I speak for everyone when I say “Thank you for all the hard work”. Very exciting! Congrats! This includes Enterprise themes too, right? Unfortunately it doesn’t include Enterprise themes. You guys are absolutely brilliant, well done for reaching this milestone and thanks for the support over the years. Greatings and congratulations from Hannover, Germany. I’ve been wondering what you had up your proverbial sleeves for theme #100 and you once again never fail to impress. Here’s to 3 years and a 100 themes, and many more to come. Congratulations! Grats! So cool. 100 is BIG!! It is not possible anymore to use Paypal? Go get them Woo’s. 100 is a massive milestone… keep at it..looking forward to 200. We’ve been promoting and using Woo Themes for ages… love your work. thanks and keep it up. Hi, so I’m thinking about purchasing the listings theme but it has not been updated for a while. Before I buy this theme for my project are you coming out with something similar in the next month? One more question. If we choose a theme now on the special, will we be able to apply our 9 theme credit to any new themes coming out or is this only for current themes? Hi, you can only pick themes available upon purchase as described in the post. May Canvas and Listings be included in the 100theme offer? Great job you are doing guys, really, happy 100 celebration! I checked this thread, and it says Listings is out of the offer, but what about canvas? IÂ´ll be completely honest. IÂ´m both amazed and dissapointed at this theme. The theme preview looks bad with the gallery part since there is loads of white space. IÂ´m not to thrilled about the frontpage using that format with slides, mini features and then having 3 rows with different areas. Which gets a completely different look when you visit a page or the blog part. Nor did I like the way the portfolio items looks since I wanted them to look like they do in Kaboodle. So congrats on making 100 themes and the 100th theme is making me twist my neck and love it at the same time. Great offer with this. IÂ´ll need to think things trough. It is a very tempting offer to say the least. Nice work and keep it all up. One thing IÂ´d love to see changed though is a bit more space between the image and the gallery on the portfolio part. And make the same gallery part work more like it does in Kaboodle :p It worked flawlessly there with no cropping being made to the images or anything. But there are cropping being made in Swatch. Or it is just some setting in the theme admin part that I havenÂ´t found just yet. Congratulations on 100 themes guys. Swatch looks great too, but I suppose I’m biased! Thanks to you! Hope you get some great exposure as we hope for lots of downloads! Congratulations with theme number 100 (already). Keep rocking the WordPress world! congrats to the WOO team! great milestone and even better deal for your customers! Hello and congrats on the 100 themes. Sorry to be a kill joy but there is nothing much to celebrate from a subscriber perspective. Where is the value? Since subscribing in mid July announcement has been released and now the free theme and 10 for $100? We think in the next coming months you’ll feel the value of your subscription. I think you’ll love what will be available with WooCommerce and more. Congratulations Woothemes!. Now I’m going to share it on my blog and grab myself 10 Developer Package Themes!. Maybe Woothemes should come up with a cute mascot. Incredible looking theme as usual. As a subscriber I can understand the plight of those who are questioning the value, but this free theme will still work fine for me. Great congrats for achieving this milestone. Still a lot have to go…. Swatch not available in downloads for club ? No documentation for Swatch also. Your site is really nice. Congratulations! Nice theme! I’m going to add it to my directory too. I want to ask, how to change front/home page (address) to blog page in Swatch theme? *can’t wait to see what you have in store for us man I can’t type today. Will do Ryan thanks for the quick response. P.S. Nice robust theme! looks like a ‘new and improved’ Coffee Break. Hey guys thanks for such a great special!! when does the 10 for $100 deal run out? Great collection of best themes. Really useful !! I love the themes here and I don’t really care if they’re free and I’m a subscription user… the only thing that I don’t like about the free themes is that I can’t download a PSD. Is there any way that people with developer subscription could download the PSD even for free themes? I am trying to buy the 10 developer theme bonus. The coupon code is not working? Please can you help as it is advertised.